Prominence UFPLC, the newest addition to Shimadzu’s family of purification system handles all steps, from fractionation to purification, within a single platform enabling recovery of target compounds with high purity in the powder form. Prominence UFPLC uses the breakthrough technology involving fraction trapping using Shimadzu’s proprietary ‘Shim-pack C2P-H’ trapping column which strongly retains target compounds allowing unwanted solvents, water and additives to be flushed away. Rinsing the column with an aqueous ammonia solution after trapping, allows compounds to be recovered as free bases, which are generally easier to powderize and typically result in high purity required for screening and pharmacokinetic studies. 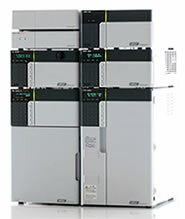 The fully automated system can be used to purify several compounds, including the main target along with simultaneous elimination of ‘difficult-to-eliminate’ counter ions such as trifluoroacetates and low-volatility solvents which cause problems during drying or testing after purification. Whether ‘free-based’ or not, all eluted compounds are finally collected in a highly volatile organic solvent, which reduces fraction dry-down time by upto 90% compared to conventional Prep LC fractions.